In the InLoox PM 7 options, you can customize and configure the InLoox PM 7 features, inter alia the project number. The options also define the project number format. For more information see Change the number format. 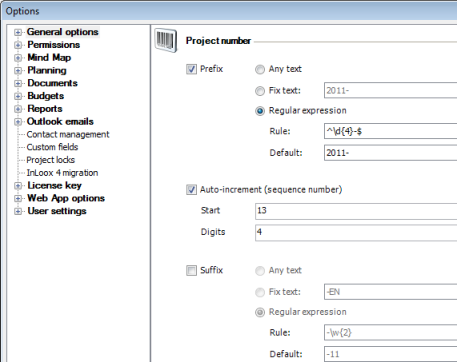 For the project number choose Prefix (leading character string), Sequence number or Suffix (trailing character string). For the number setting, you need at least a Prefix or a Sequence number. Combine a Prefix or Suffix with a Sequence number. Any character string of any length, which can be changed. Any character string of any length, which cannot be changed, e.g. the word project. Input a format and an example. Please note the format rules, for more information see Change the number format. InLoox PM verifies if the number of the created project has the right format. If the number doesn't correspond to the specified format, the user is asked to correct the project number. "Project 2011-" (fixed prefix with year). "Sequence number" (maximum 3 digits with leading zeroes). "Sequence number" (maximum 5 digits with leading zeroes). Country code (-DE, -AT, -FR, ...). "Sequence number" (maximum 6 digits with leading zeroes). New projects are created automatically with project numbers in the new format. Existing projects retain their old numbers. Once assigned sequence numbers cannot be used again. How to edit the project number | InLoox PM 7 • Copyright 1999-2019 © InLoox, Inc. All rights reserved.